Even though Joss Whedon has taken over the Justice League reshoots, original director Zack Snyder will still be credited as the director, with the filmmaker taking to social media to share a new image from the film. The director revealed on the social media platform Vero that this image was the last shot of Justice League featuring Jason Momoa on the Iceland set, featuring the shirtless actor raising his arms in a rage, while standing in knee-deep water. The image also showcases a number of different camera men and other crew members. It isn't exactly clear when this image was taken. The image surfaced on the Zack Snyder Vero account (via The Daily Popcorn Twitter), although he wouldn't offer any further updates at this time. We reported last month that the Justice League reshoots were spiraling out of control, with scheduling conflicts arising with Henry Cavill, who has been going back and forth between Mission: Impossible 6 and the reshoots for this movie. 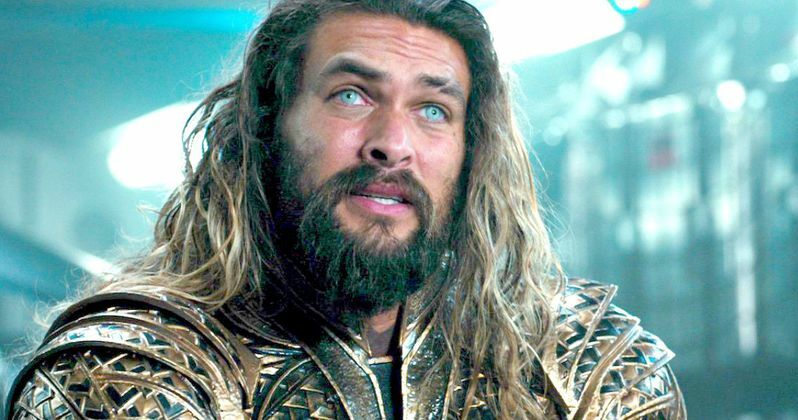 While unconfirmed, that report claimed that Warner Bros. has spent upwards of $25 million on reshoots, a much higher figure than the $6 million to $10 million typically earmarked for reshoots, which often take up about five weeks. These reshoots for Justice League have dragged on for more than two months, but there still hasn't been any talk of the movie missing its release date. Ben Affleck made some very interesting comments earlier this month, stating that this Justice League movie is the product of two directors, Zack Snyder and Joss Whedon. The actor added that both have very strong visions and unique takes on the material, with the actor stating that he loved working with both directors. Joss Whedon was said to have been brought on to punch up the dialogue, adding more humor and also altering the Cyborg (Ray Fisher) story, which is said to be at the "heart" of this adventure. Cyborg has been confirmed to be one of the "Mother Boxes" that the villainous Steppenwolf is seeking for Darkseid in this superhero adventure. As for this photo, it's possible that this was taken way back in October 2016, when Jason Momoa shared several Instagram photos with Ben Affleck, Zack Snyder and more, as he shared beers with his cast and crew after wrapping production in Iceland. Still, with extensive reshoots taking place, it's possible that Jason Momoa and the rest of the cast had to return to Iceland once Joss Whedon took over for Zack Snyder, but very little has been confirmed about the project since Joss Whedon took the reins. There was also a recent rumor that Justice League will kill a major character, and that it may in fact be Ben Affleck's Batman. While that seems a bit far-fetched, since Warner Bros. is planning The Batman reboot, with Ben Affleck starring and Matt Reeves now taking the helm as the new director, there have also been rumors that Ben Affleck is done with the franchise altogether, although nothing has been confirmed as of yet. All that is known for sure is that Justice League will hit theaters on November 17, with the currently untitled sequel also set for release on June 14, 2019. Take a look at the latest image from Justice League below.